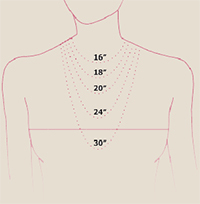 It can be difficult to visualise how low a necklace might hang, so we have put together an approximate guide to chain lengths to assist our customers. Most of our adult necklaces are supplied on 18" chains, but several statement pieces (notably in the Heritage Collection and Woodland Trust Charity Collection) are supplied on longer chains. All necklaces in our Children's Collection are supplied on 14" chains. The Simplicity Collection offers a choice of chain length - 14", 16" or 18". As a rough guide, a 16" chain will sit just above the collarbone, while an 18" chain will sit on the collarbone. A pendant attached to an 18" necklace will generally lie above the breastbone.